The Tarp of choice for the replacement of shade canopy top is the black mesh tarp. The black mesh tarps works excellent as it is so closely knitted which lets in just the right amount of sunlight and still keeps that shade look. 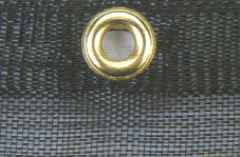 Also the material is extremely high quality and will last years, the black mesh tarp includes grommets Approx. Every 2 Feet, Mildew proof ,Tear Resistant, 80% Shade, Acid Resistant, Heavy Duty Poly Tarp, Artic Flexibility and UV Treated. These black mesh tarps work excellent for a shade canopy but also work great for patios, as the black mesh tarp can be used on the sides of your patio or over the patio. Tarps Plus carries a wide selection of mesh tarps in different sizes from large to small we suggest you take a look at our wide selection of black mesh tarps on Tarpsplus.com. I just bought a case of your black mesh tarps I am exited to receive them. Three dozen black mesh tarps arrived just in time.